In this humorous self-portait you can see that either there is still plenty of room for new information in my head, or that my capacity to understand things is a bit limited. Lol! I had an epiphany today. I realized that I will never know anything about my future in stock photography. You see, for twenty years I have been convinced that in six months I would understand just where my stock photo career is headed…and it finally dawned on me that, if after twenty years I still didn’t know where my career was headed, I never would know. Now during those twenty years I seemed to be able to make a pretty good living (solely off of stock for the last seven years-stock and assignments before that)…and though the times are tough right now, I am still doing reasonably well. Looking back, the problem has never been the present…and the only problem with the future has been my worrying about it. Worry never does any good. Actions are what make the difference. So what I do know is that I can’t let worry get in the way of actions. Yeah, I don’t really know much for sure. But I believe that in the long run a website that is high on SEO targeted towards the appropriate audience can and will make a difference. I believe that in the short term creating as many great images as you can, that are truly needed in the market, is the best bet for earning a living through stock. I believe that agencies, with all their problems are still the best way for most of us to make money from stock photos. I believe that money is being left on the table in copies quantities, both by microstock agencies and by Getty and the other traditional agencies as well. I was bouncing around on the Internet last night checking out the latest word on the stock photo industry and I have to admit it was a tad depressing. It may well be a better strategy to avoid the negative information and focus on making great photos…photos that have your unique viewpoint that make them rise above the great morass of images flooding the market. This has become a much tougher business, but I still think it is an awesome one, and at least in my experience; the return on investment is impossible to beat even in these less than stellar days. I am more excited about the work I am doing now than I ever have been. Will that work sell well? Will the gradually increasing economy bring more revenue? Will tablet computers (apparently someone buys an iPad every three seconds) offer hope for a bigger stock photography market? I wish I knew the answers to those questions, and others, but I don’t. What I have always done that has worked well for me, has been to work very hard at creating images that I thought could be used by the advertising community and that made me happy. I have sought out a variety of venues for distributing my images and continue to do so, from unusual ones (for typical stock shooters) such as CafePress, to the traditional agencies, to attempting to make my website a truly effective tool for increasing the visibility of my imagery. I started out shooting agricultural stock. My first ever stock photo sale was a picture of tomatoes! I quickly shifted into high tech, and when Photoshop came along I dove right into composite work. When Blend Images came into my life I learned to do lifestyle shoots. I have dipped my toe cautiously into video and believe it may have a place, though not a big one, in my stock efforts. About the only thing I haven’t tried is Microstock. At this point, considering my work-flow and style, and the price points currently in vogue, I just don’t feel it is right for me. But then, what the heck do I know? Not having a system to deal with flash memory cards, especially in the heat of battle, cost me most of my images from this Genghis Khan re-enactment. 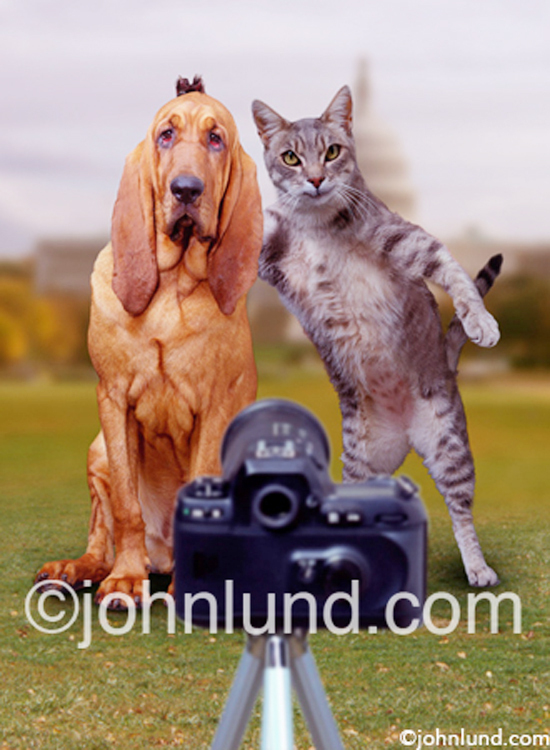 Having my images on my web site brings in additional revenue. I was with a couple of friends. We were out exploring the countryside surrounding Ulan Bator, the capital of Mongolia. Up ahead, alongside the road, there appeared to be some kind of festival happening, so we rolled on over to check it out. There was a makeshift grandstand, a covered eating area and a few tent structures from which people were selling food and drinks. There were even a few booths with crafts for sale and demonstrations of various kinds. We had stumbled upon the Mongolian equivalent of a Renaissance Faire! People were beginning to gather at the grandstand so we ambled on over to see what was happening. In the distance we could see dust clouds drifting over the low hills…and then cresting the nearest hill came hundreds of Mongolians on horseback wearing the costumes of the ancient warriors of Genghis Khan! 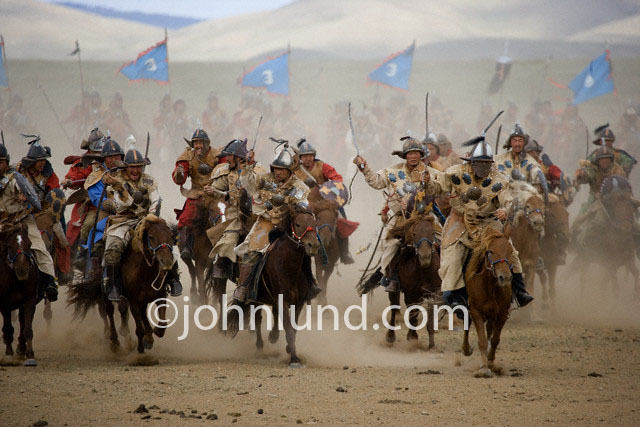 Wearing iron and leather helmets, brandishing swords, lances and bows and arrows , with banners flying in the wind, the Mongolian hordes were truly at the gates! It was an awesome sight. It was as if we had been transported back in time. Two opposing armies had gathered several hundred yards apart on each side of the grandstand. In the distance we could see a huge catapult and a Yurt marked with the battle standards of the Mongol Emperor. Various individuals would race across the distance displaying extraordinary riding skills, leaning down and plucking spears and other items from the ground while maintaining a full gallop. Eventually the two armies advance towards each other and merged in mock combat. The spectacle, a re-creation of an ancient battle, was a celebration of the birthday of the father of Mongolia, Genghis Khan. It was fascinating to watch. Individuals paired off slashing at each other with swords and stabbing with their spears and lances. I watched as two combatants parried with swords while a third horseman, bearing a lance and, undetected, approached from behind and pretended to skewer one of the embattled warriors. As the horses twisted and pranced beneath their riders their hooves kicked up clouds of dust, and slowly the entire battle scene began to disappear into a brown cloud. “This must have been how it really looked”, I thought to myself. Being photographers, all of us were busily shooting away. I had an eight-gig card in my camera and about half way through the melee I had filled it up. Not wanting to miss a second of the action, I frantically pulled a fresh card from my pocket, removed the full card, fumbled the new one into the camera, formatted it and got back to shooting. It wasn’t until I was back in my hotel room that evening that I realized that somehow, in all the excitement, I had put the original card back into the camera and formatted it…losing over half of my shots! Aarrgh! It still hurts thinking about it. That little episode truly impressed upon me the importance of having a system to help keep track of full cards and empty ones. Of course, it wasn’t the first time I had been “truly impressed” with that sort of thing. Once, on a boat traveling down the Iriwaddy river in Burma , I was shooting Chinese fishing nets during a sunset when…actually, that is another story for another time. Let’s just say that having a system, for dealing with flash cards and sticking to it, can be a very important part of your photography process! But there is another, I think more important aspect to this story. A few days ago I got a message from my website (my actual e-mail address is not visible to prevent spam “harvesting”). It was from the art director of a French magazine. He wants to use some of those photos from the Genghis Khan re-enactment. I asked him if he had searched Corbis because the images are online with them. He replied that Corbis didn’t work very well in France and that he couldn’t see the thumbnails. WTH (What the heck)? Well, whatever the explanation, the fact remains that my website was important for getting me revenue from images carried by a stock agency. My website allows me to take some measure of control and supplement the reach of the agency as well as to get my non-agency images out to the world. Taking control of your own destiny is going to continue to grow in importance as the world of photography plunges ahead into the unknown territory of the future .